This is another recording from the distinguished Collins Classics catalogue now reissued. It arrived complete with the rave review from Gramophone printed on the liner, leaving the poor reviewer with little to do but agree enthusiastically after a single very enjoyable hearing. To paraphrase that review and call it my own would be dishonest and to reprint it would be an evasion and might bring us a bill for royalties or land us in an infringement action. To find something to do to earn my bread, I re-listened to the James Galway recording of this same repertoire, accompanied by Jörg Faerber and the Württemburgisches Kammerorchster Heilbron. Both flautists are British and both play with astounding virtuosity both in the rapid passage work of the fast movements as well as in the long phrases of the slow movements. Both orchestras perform the fast movements with a high energy driving beat in the tense Stürm und Drang style, what the composer would possibly have described as "old fashioned," with Faerber obtaining a slightly sweeter and more varied sound and Lubbock obtaining a slightly more "Baroque" orchestra sound. Both orchestras play the slow movement accompaniments with deep affect and drama. Galway ornaments the slow movements more elaborately than Stinton and his phrasing is slightly more lyrical and more openly emotional. C.P.E. Bach probably would have liked this "modern" performance better. Stinton and Lubbock make C.P.E. 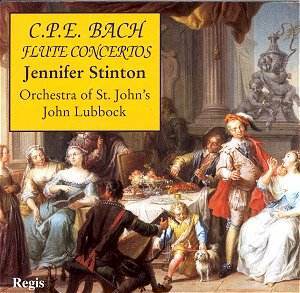 Bach sound just a little more like J. S. Bach, stressing the threads of his father�s style that survive in his music, and this to a contemporary audience is probably a good thing. The Flute Concertos also exist in harpsichord concerto versions (in respective order, H. 426, H. 438, H. 445) but these versions have not been included in the "complete" harpsichord concerto recording by Miklos Spanyi and the Concerto Armonico. While this prevents me making a direct comparison, it suggests that Mr. Spanyi felt that the flute versions were to be preferred and he saw nothing to be gained by duplicating them on the harpsichord. This is an exceptionally fine recording of this repertoire, but if you already own the Galway/Faerber version, you can be content with it.